TENERIFE SURF CAMP | TSC stands for surf camps, surf events, corporate team building retreats in Tenerife. We are a bunch of friends living on one of the most beautiful islands of the Canaries. We are connected not only by friendship but a positive attitude to all aspects of life and the willingness to share our passions and knowledge. Our main passion is surfing, surfing and surfing again!!! After that we put skateboarding (longboards), good quality food, music and endless chilling on the beach. As a surfing school in Tenerife, we organise surf camps, individual surf courses, surf events and corporate team building events called Surf Incentive in Tenerife. IMPORTANT! Our surf offer is not for everyone. We value comfort and convenience – ours and our clients, but we do not offer an All Inclusive type holiday – 5-star hotel + “roasting” by the pool. We are SURF CHILL EXCLUSIVE! If you want to learn the basics of surfing, to improve your surf skills, and also to relax, feel the surf vibrations, you’ve come to the right place. If you want to forget about temporal problems, “glide” above the surrounding reality, concentrate on your inner self, taste the wonderful culinary flavours (vegan and vegetarian options), breathe in clean air – simply stop for a moment – contact us. We have full equipment facilities (boards, wet suits, etc. ), professional and certified surf instructors, tutors – guides who know Tenerife inside out, people with several years experience in organising dedicated sports courses, group trips, team building events, trips, corporate retreats, etc. We also invite people, groups, companies interested in surfing as a theme in their productions of video projects, photo sessions, etc. We have a wealth of experience in these areas, the necessary equipment, lots of time and “we know what it is all about”. Aloha Chicas, Chicos, Amigas y Amigos! We are connected not only by friendship but a positive attitude to all aspects of life and the willingness to share our passions and knowledge. Our main passion is surfing, surfing and surfing again!!! After that we put skateboarding (longboards), good quality food, music and endless chilling on the beach. As a surfing school in Tenerife, we organise surf camps, individual surf courses, surf events and corporate team building events called Surf Incentive in Tenerife. Individual or group surfing lessons in Tenerife will allow you to quickly acquire basic reflexes in the water, get to know the techniques and secrets of ocean behaviour in a quick and effective way. Begin learning to surf on the island of eternal spring, where the conditions for madness on the waves last all year long. 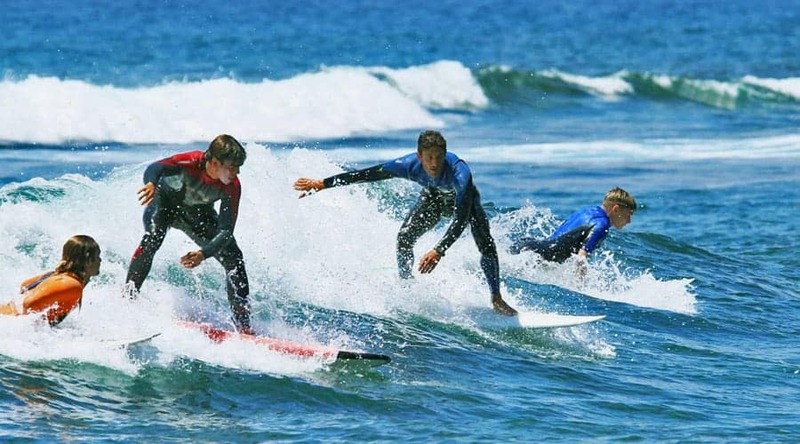 Active holidays in Tenerife are group holidays for people who want to learn about surfing from scratch or explore the secrets of surfing, improve their skills and learn about secret locations and beautiful surf spots in Tenerife. This is the perfect offer for a company retreat or event, or as an element of the Incentive offer. We invite you to take advantage of additional attractions during courses and surfing camps in Tenerife. Yoga, paddle board, surf trips around the island, bike trips (road and mountain), canoes, diving with turtles, snorkeling and many more. We organise surf group holidays, trips and events in Tenerife. Dedicated corporate retreats are tailored to individual customer requirements. We will plan, coordinate and archivise your group’s stay in Tenerife in a surf style. Gone SURF. Be back at SUNSET.